A child and her quick-thinking father are being credited with saving a Quispamsis family from their burning home. The house fire was reported at 2:45 a.m. Sunday and was beyond saving in minutes. Alec Taylor, assistant deputy chief with the Kennebecasis Valley Fire Department says he couldn't believe how fast the fire on Devonshire Crescent spread. An 11-year-old girl who lives across the street first spotted the fire. She told her father who ran into the burning building and awoke the family living in the two-storey home. If it hadn't been for the fast-acting neighbour, Taylor says he believes there would've been fatalities. 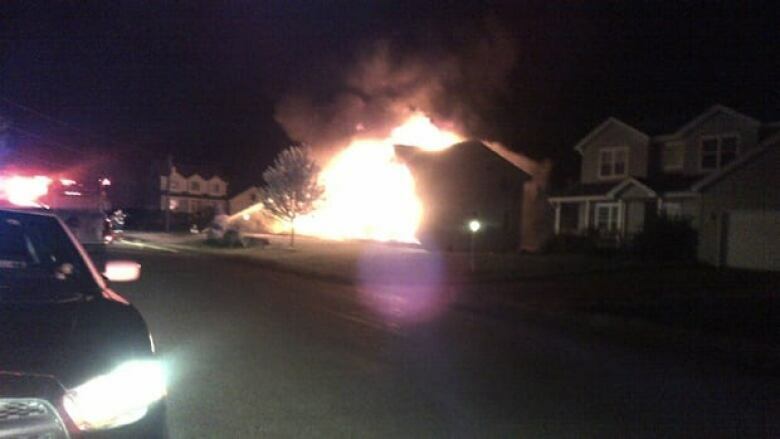 Both the home and the vehicles in the driveway were destroyed in the blaze. The family is now staying with neighbours. Fire officials are investigating the cause of the blaze.